Minimum width of doorway for delivery: 21.00"
Top of cushion to top of back: 18.25"
Sleeper for small apartment. Good reviews. Good price. I love the color and the style. Most of the other futons required the back to go down - which means it would need to be away from the wall. This model has the cushion pull out, so I can place it against the wall and simply pull out the bed as needed. The price and size sound like it will fit my small apartment well! Also, the fact it has a bed built in will be great for guests! We chose this for an extra room in our home because we wanted a couch with a chaise and a sleeper that was not the typical fold out version and for the fact it has high ratings, is a great price and we like the styling and color. Cute design, different type of sleeper which makes it more versatile and easy. Like the look and functionality. Looks comfortable, versatile and the price. It's a sectional and a sleeper under $400. It's an amazing deal. The price was great, the reviews were above average, and it has every feature we wanted: a gray sofa with a chaise and sleeper option. LIke the look of it and the size. Also like the sleeper. Do Twin Size Sheets fit on the bed when it's pulled out? Twin size sheets will not fit on this sleeper when pulled out. The sleeping area is about the size of a full size bed when pulled out. Is the non-chaise depth 20.75in from the very back of the sofa to the front of the seat or is 20.75 just the seat depth without considering the back cushion part? Thanks for your inquiry. 20.75" is the seat depth only. It does not include the back frame of the sofa. It’s about 21 inches from the back cushion to the edge of the seat; not from the back of the sofa. Does the chaise lounge lift up for storage? BEST ANSWER: Hello and thank you for the inquiry. The Jarreau Sofa chaise Sleeper does not have storage. is the chaise lounge and couch part 2 pieces that are put together? Trying to figure out if it'll fit though our 30" basement door. Thanks for your inquiry. This item will fit through a 30" doorway! The minimum width of the doorway required for delivery is 21". This fit in my basement door perfect! It’s a bit heavy but petite in size. Looks beautiful! Very firm which is perfect for my back. Are the back cushions removable? Thanks for your inquiry. Yes, the back cushions are loose! My apartment is upstairs, the door is 30” large and 80” height. Can it fit to come in? BEST ANSWER: Hello and thank you for the inquiry. The minimum width of doorway for delivery is 21.00" for this item. Delivery personnel are not able to hoist or lift above the third story/floor; a service elevator would be need to be available. what size is the sleeper, queen or full? This sofa fit perfectly. Looks great. The delivery guys were great. Very comfortable after broke in! Great to lounge in and watch TV! It fit perfect in our little corner of our apartment! Love the pull out piece for a bed! I have had this about a month, I have an odd living room space that has 5 doors and a double window...this couch worked out so perfectly I am going to buy another one to go directly across from it to replace two chairs, can not wait to get it here! We wanted a stylish transitional sleeper sofa for our living room, and we are very happy with the Jarreau sofa we purchased. The color, a mid-range charcoal-to-steel gray, and clean, tailored lines go perfectly with our other furnishings. We get lots of compliments on the style. If you are looking for a squishy, pillowy sofa, this is probably not going to be your best choice, but if you want firmer seating, this is the ticket. I regularly nap on the chaise portion, and I'm perfectly comfortable. The only discomfort I experience is if I sit half on the chaise portion, half on the next (middle) cushion, because there is a wooden support between the two sections there. That is simple enough to avoid, though. We are buying the Jarreau accent chair to go along with the sofa. We are extremely happy with our purchase. Great for a small space! I love this couch. I saw some reviews mentioning it seems smaller than in the pictures and that it was uncomfortable/too firm. Needed a sleeper in my small apartment so I ordered it. I’m so happy I did! Delivery was easy and fast. The couch it’s self is a great size and the seating area is larger than I anticipated from the dimensions. It is firm, but definitely not too firm. It’s comfortable to sit on and the sleeper it’s self doesnt seem too bad. A nice full size mattress topper and it’s perfect for guests. ibwould definitely recommend this. Great price and much nicer than comparable sleeper sofas from the Swedish competitor. It’s exactly as advertised. Looks great! The delivery team was fantastic! The price was reasonable it’s not super big or plush (more firm) but comfortable for us. I love the hidden bench inside that way we both can prop up or feet up. That’s my favorite part. It was delivered on time with plenty of notice and set up/ cleaned up less than 10 minutes. 1 month owner I’m enjoing it right now as I write this review. My daughter loves this couch!!! We recently had to downsize from a house to a smaller apartment so size was an issue.I have bought furniture in the past from Ashley ,the furniture was great. My Lulu loves the couch,she has her spot for getting her sun.It is a great value and a wonderful starter piece. I purchased black Friday weekend, great price. A bit stiff, with time I'm sure it will be perfect. Very comfortable and roomy, can be openned up to a bed, good for guests sleep-over. I was on the hunt for a sofa sleeper chaise that would be comfortable and be small enough to fit in my studio space. When I saw this couch online, I immediately knew it was the one. However, after reading some of the reviews saying it was “too firm”, I became worried that it’s going to be uncomfortable. To alleviate my anxiety, I decided to go to an Ashley home store to see and try sitting on this couch in person. When I did, I found that it was actually really comfortable and stylish. There was a thought in my mind that it could be cause it was a floor model and the cushions got broken in. I decided to buy it and see what happens. When I got the couch and sat on it for the first time, it felt kind of firm, but not uncomfortable firm. If anything it was like a supportive firm. It felt fine to me. My favorite thing about the couch is the sleeper pull out option... I use it more often then not, cause why not? Now that I’ve had this couch for a couple of weeks, the cushions have been broken in a bit and feel even more comfortable than the first time I sat on it. Overall, this purchasing this couch was one of the best decisions I’ve ever made, and I love it so much. I would 100% recommend buying this couch to anyone who’s on the fence about buying it. DONT HESITATE and PURCHASE IT! We needed an inexpensive solution for a tight space and this sofa fit the ticket. It’s a little firm, but we got used to it in a few days. Very happy with this purchase. I really enjoy being able to stretch out on the chaise lounge while watching movies/sports. The sofa is very comfortable and stylish. With the pullout cushion to make it into a sleeper, it is great it doesn't take up as much room as a traditional sleeper sofa. I’m very happy with this sofa! Perfect for small space. I researched this for awhile before I actually got this. I have a 1 bedroom apartment but I wanted something guests could sleep on if need be. This is perfect and cozy! I always have it extended and have a bunch of fluffy pillows on it! This couch is super stylish and comfortable. I bought this for an extra place to sleep when staying at my daughters condo. I throw an inexpensive egg foam mattress topper on it and can sleep comfortably for several days at a time. Perfect size couch for the space. Nice firm foam cushions. Solid construction. We needed additional seating and an extra bed for when the grandchildren visit. This fit the bill without breaking the budget. It's comfortable and a nice size..
Super cute gray sleeper sectional. It’s perfect for my “smedium” living room. I personally love it. I paired it with a round coffee table. We have had this for a month and we love it more then our mattress. It is so comfy and firm! I got this sofa bed for my tiny studio and I loved! I can turn it into a bed in the night and the day I have a comfortable sofa and it looks great! Love this couch. It has the right amount of firmness s ok you don't sink in. And its perfect size for our place. I bought a week ago, feels super comfortable! !great looking at my living room. I bought this because I wanted more solid colors in my living room as I move to an empty nester. state of life. The delivery men were EXCELLENT!!! I like a hard solid surface so this couch meets all my needs, it fit nicely in my living room and I've already had guest sleep over on it. The only thing I can say is turning it into a 'bed' takes two people at this time because it's stiff. At the store it was a one hand motion, but I suppose after more use it will become that way. Look good in the room and it adds just what I needed for entertaining. Great sofa for my apartment! I am on my own again and needed a sofa for my apartment! I really love my new sofa! It is comfortable. Also, it is good for my grown kids to sleep on when they come to town. I am very pleased with it. I bought one in blue for our daughter’s apartment and we loved it so much I bought another one in grey for my son and daughter-in-law’s tv room. They keep it set as a bed for cozy movie night. Easily fits 3 full size adults. I am completely satisfied with my purchase and the cuatomer aervice I received from their associates. The piece itself is the perfect size for my apartment (650sq ft) and doesn't take up the entire living room. It looks just like its photos and thw delivery team assemled it and placed it expeditiously and efficiently. be advised: the cushions are firm but neither me nor my boyfriend find them uncomfortable and we've both lounged and taken multiple naps on it. 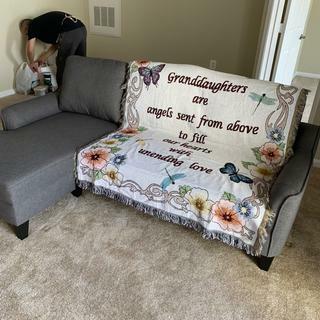 Also, we were able to get it for a better price via the website (it was on sale at the time) than similar couches elsewhere, which includes the cost of delivery. This purchase was an excellent buy for our needs and a very painless process. Just delivered by two clean and very professional guys!! They put it together in no time flat so don’t doubt the delivery and assembly fee as it’s so well worth the price. The sectional is beautiful, very well made(not skimpy or cheap) and super firm denoting quality foam. Couldn’t be happier. Will review again after I’ve slept in it. I just got this delivered today. I was worried about buying site unseen to be honest as I could not locate one in a store anywhere near me to try out but the size and color were perfect for my small extra bedroom upstairs and it was on sale. Delivery went great, sofa size is perfect and looks really nice in the small room (a 10x11 extra bedroom). I like that it flips out into a sofa bed. I wish it were a bit softer, not going to lie, but from the reviews I had read I knew it was going to be on the firm side. It definitely is quite firm, but this sofa will be mainly used by my teen for him to lounge on and play his ps4 so it should be good for that and other reviewers said that the cushions break in. Still has to pass my son's test but he is moving from a futon to this so I am sure he will be fine. If you are looking for a somewhat soft sofa, this is not it, but if you like a very firm sofa and a small size, it's good for that. Would I put this in my main living room? No, but great for a game room. Very firm. Should’ve gone with the softer couch I was deciding between but the sleeper on this doesn’t have springs and is quite comfy for a bed. Chaise is a little too short. They should have added at least 6” - 8” more to the length. It feels awkward. Would be good for. Second room but not a main living space. This works for my space since it’s a small space but wish I would’ve picked the other couch. Happy that this works for an extra bed for guests or my son from college!! It has a fit and function that are ideal for our small apartment. reading a book, its nice. I have had a large chaise lounge sofa before i I enjoyed it functionality. I moved to a smaller place, so I needed someting smaller. This fit the bill perfectly. I like the color and it's usability. The only reason it didn't get a 5 star rating is because of it's uncomfortableness. It definitely requires some a adjusting and I would not recommended anyone sleeping on it for more than a night or two. Small size and sleeper function was my first priority, so this sofa is great. BUT it is super short so your legs will hang over the chaise and you need an ottoman for the other side. I was hoping it would pull out to a full size bed, but it is only 46 inches wide which is halfway between a twin and a full. I will still squeeze two of my friends on it though! Love the couch, it is a little firm to sit on but I think that it will be comfortable for sleeping. Just received my sofa a few days ago and it functions just great. I ordered the sofa in the gray color and was shocked to see that it is actually slate blue. Thankfully it works okay with my decor. However, I ordered the matching chair in blue and it does not give me the quiet the contrast that I was looking for. It just looks like I have 2 different blue pieces of furniture on purpose, and that was not my intention. Bought this for our guest room. Perfect size and durable fabric. Love it so far! Get what you pay for. Not as soft material. Pull out sleeper doesn't appear to be that sturdy. This couch is really great for the price. It is a great size for our small apartment. It is quite hard, and it is not overly comfortable, but a few pillows and wearing it in helps. Great value. Top-of-the-line design and comfort are one and the same with the Jarreau chair. The sleek silhouette and oversized pillow back make it a blissful contemporary retreat that you’ll want to sink back into every time. The piping along the arms as well as the tapered, exposed feet add a chic, timeless touch to the piece. Perfect for space living and entertaining. Vivid jewel tone color palettes and bold painterly patterns give the Pepin collection an impressive look for a rug that is easily within reach of most consumers. This machine-made polypropylene brings a feel of high end elegance and artistry to any space.